Besides compatibility with Windows 10, other highlights of LibreOffice 5 include an improved user interface, better management of screen space, a cleaner look and new spreadsheet features supporting complex formulae, new functions and conditional formatting. The addition of new and improved filters to handle non standard formats in the upgrade is said to make for better interoperability with other office suites like Microsoft Office and Apple iWork. New icons and improvements to menus and sidebar give the Office 5 overall a more intuitive interface. LibreOffice 5 is the first rev of the suite to offer 64-bit support for Windows. While Microsoft’s pricey Office suite is the defacto standard among individuals and businesses, LibreOffice has its followers, particularly in Europe and South America. It’s not clear exactly how many people or organizations use LibreOffice. But LibreOffice’s backer The Document Foundation estimates that the office suite has over 80 million users. LibreOffice 5 is available for Linux (CentOS, Ubuntu and Debian), Mac OS X and Windows. A LibreOffice Viewer for Android is available for download on Google Play. 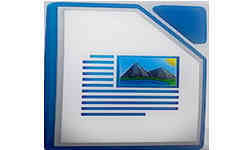 You can download LibreOffice 5 here.